As well as offering a full catering service we also operate a very successful and fast growing food vending solution. We already supply many leading businesses over the south including P&H, Gemalto, Sumika, Lewmar, Huhtamaki and Vector Aerospace Gosport. We only use the latest state-of-the-art food vending machines, supplied by our good friends at Bettavend in Southampton, who are leading the way in vending innovation and solutions. 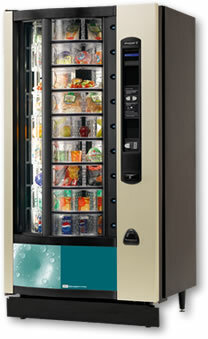 They offer a full range of machines including snack, confectionery and quality hot and cold drinks machines. Please visit their website or call them for a look around their impressive selection of vending machines at their show room in Southampton. All the food and snack/confectionery machines can work in conjunction with hot and cold drinks machines to offer a full refreshment solution – ideal for canteens, breakout areas, leisure facilities etc. We have the perfect answer for fresh food vending – a great solution for those looking for healthier options too. Offering easy-to-reach tempting alternatives to traditional snacks will encourage people to take appropriate breaks and eat properly at meal times, particularly in a 24/7 environment. 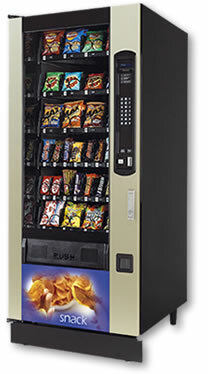 A food merchandiser offers the widest selection of products available from one machine. With large individual compartments that can be configured to hold a range of items, from plated main meals, salads, sandwiches, fresh rolls, paninis, jacket potatoes, baguettes, breakfast muffins, pies, pasta dishes, yoghurts, fruit and much more. As the machines are temperature controlled your food will always be kept fresh and cool until you are ready to vend your favourite product. Or you may choose a item that can be quickly heated in a microwave such as a delicious panini, a breakfast muffin, jacket potato, pasta bake or even a nutritious hot meal. Its up to you.